The CPRE demonstrates a commitment for professional Requirements Engineering and highlights your RE expertise within the market - both as a company and as a professional. The CPRE certificate has lifelong validity and stands for outstanding professionalism in Requirements Engineering. CPRE training courses are offered worldwide by our recognized training providers. They provide the most efficient way to get prepared for the exam. The CPRE expands your professional knowledge and is evidence of your expertise in RE. It improves your chances in the workplace and raises your market value. As a partner of IREB your company demonstrates a strong commitment to professional RE. Special marketing material and preferential support form part of the partnership agreement. Benefit from our excellent reputation! Register at the CPRE Registry and benefit from the insignia! IREB, the International Requirements Engineering Board - a non-profit organization - is the provider of the CPRE (Certified Professional for Requirements Engineering) certification scheme. 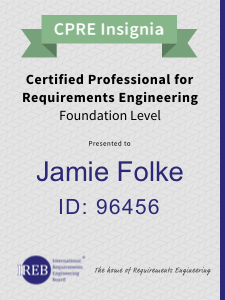 The Certified Professional for Requirements Engineering represents a carefully elaborated three level certification concept. It addresses practitioners working in Business Analysis, Requirements Engineering and Testing, who place high demands on the quality of their work.